JUNE 6, 2018. –Taking over 400 hours to design, build and bake, a custom-made, huge cake was recently revealed in South Africa in an effort to raise awareness of the plight of lions in that nation and across the world. 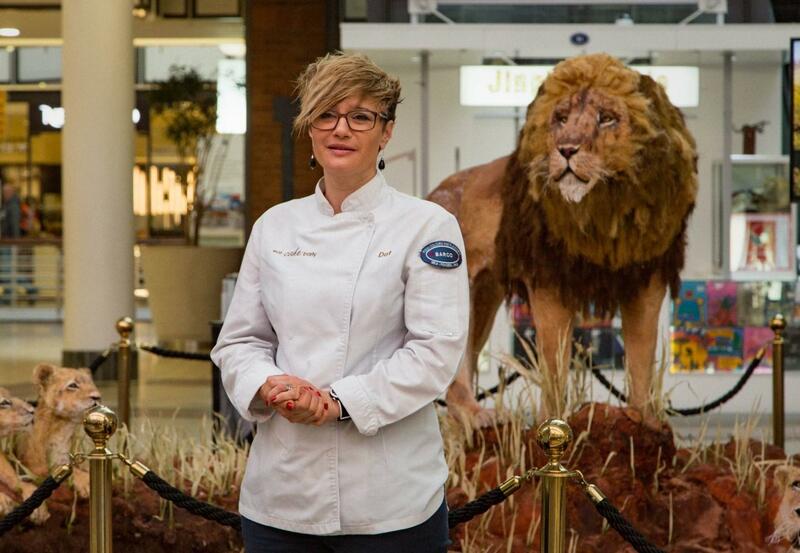 FOUR PAWS, an international animal welfare organization, joined world-renowned cake artist Dot Klerck from Eat Cake Party, along with Elda Thomas from South African Wildlife Project, to bake and build the massive cake of a pride of lions. The cake includes lions, lionesses, cubs and some scenery from the African plain. The cake dovetails with the launch of the FOUR PAWS International’s effort #RiseUpAndRoar, an awareness campaign against the trade and often brutal killings of lions. Around the world, countless numbers of big cats are forced to live and suffer in circuses, rundown zoos, in private hands or are bred for the hunting industry and trade of their parts. Meanwhile, wild lions are also at risk because of habit encroachment and merciless hunting activities. Working for more than 400 hours over the last five weeks, Klerck and her assistant, Elmarie Louw, created a cake masterpiece comprised of 209 pounds of fondant, 220 pounds of chocolate, 176 pounds of modelling chocolate, 110 pounds of buttercream, and 50 giant sheet cakes all supplied by the cake sponsors, Bakels, Value Baking Supplies and Barco. "Delivering a cake of this size-- 4 meters by 5 meters--was probably the most challenging part of the whole five-week process." This is not the first time Klerck and Louw took on this kind of animal welfare awareness project: last year they created a life-size elephant with a calf and the previous year a rhino. Klerck specializes in large, life-size realistic creations. With her work for the #RiseUpAndRoar campaign, she hopes the plight of lions will be more visible and at the forefront in the minds of the public and government. Despite mounting evidence and public pressure, action to regulate and ultimately shut down the lion industry has not been forthcoming. Lions are still being served to their hunters during canned hunting events. These animals are born in captivity or are taken from their mothers within hours of being born in order to be also used in petting zoos. When they become of age, they then spend the rest of their life in caged compounds waiting to be released in a larger compound for the so called ‘canned’ hunt. With the campaign, FOUR PAWS is highlighting the need to provide lions the greatest possible protection to ensure lions are no longer used for parts or are traded, other than for the purposes of rescue, sanctuary work or as part of an endangered species breeding program, and strict scientific research. FOUR PAWS has been working for 25 years to improve the situation for lions and other animals. From running Big Cat Sanctuary LIONSROCK in South Africa, to rescuing and transporting wild animals from all walks of life, to campaigning for policy changes, FOUR PAWS is a global leader in the well-being and protection of these animals. FOUR PAWS is looking for 300,000 signatures to present to the South African authorities to ensure that during the 2019 CITES COP 18 Conference being held in Sri Lanka, members vote to provide the lion with the highest possible protection. Author of Cuddle me, Kill me, Richard Peirce, also attended the launch of the campaign. His book reveals horrifying facts about the canned lion hunting industry. To support FOUR PAWS’ work and a more humane life for lions, supporters can sign the FOUR PAWS’ petition asking the South African government for stricter protections for lions, click here.